Favorite things: Roughhousing in every way, shape, and form - until it's time for a snuggle break. Daycare personality: From the moment he arrives at Unleashed in the morning, until he goes home at night, Eddie is on the move. A total party animal, Eddie is usually the one to get the crew riled up in the morning, taunting anyone and everyone to play. Most days, Madison or Lily is there to oblige, but no one is immune to Eddie's charms! It's a good thing, too, because he can cycle through every possible sparring partner and still have energy to spare. What we love most about him: He may weigh in at only 10 pounds, but Eddie is the biggest dog at daycare - he's as rough-and-tumble and fearless as they come! Best friend at Unleashed: His girlfriend, Ruby! 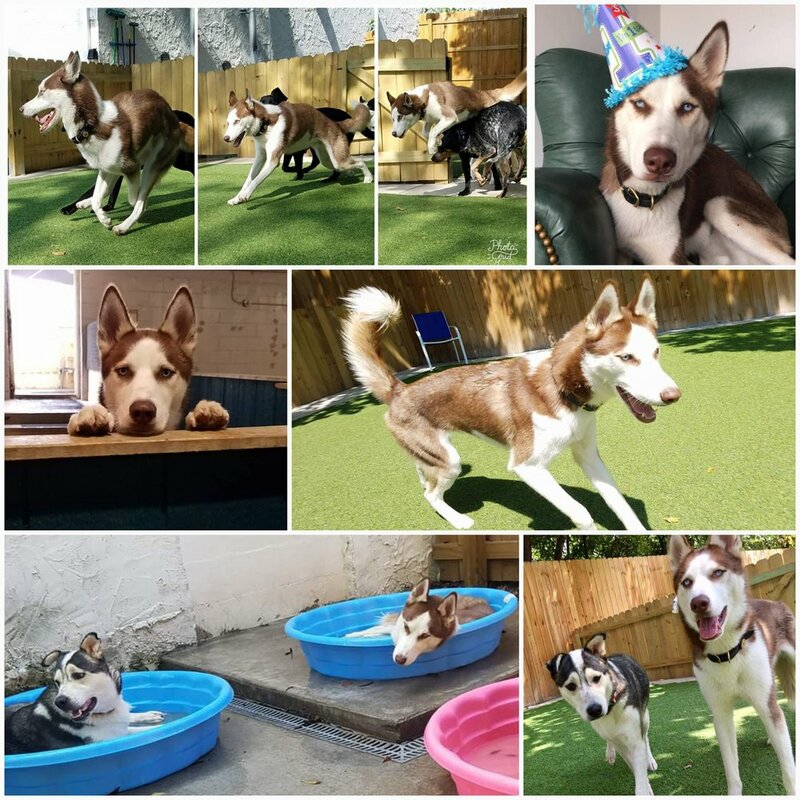 Daycare personality: Grover is a very expressive dog - from his sardonic expressions and frequent vocalizations to his ability to ditch a playgroup by jumping the fence when he's bored, we always know exactly how Grover feels. He loves to wrestle, and anyone is fair game. He's got a full roster of regular playmates, but if Ruby's around, Grover won't want anybody else! When he's finally tired out, you can find him lounging in a kiddie pool, watching over the action with an indolent gaze. What we love most about him: That signature husky howl - Grover always tells us what he's thinking! Walk personality: Ellie hangs out in her yard rather than go for walks, but she loves to play, play, play! She's a rambunctious little pup who's always on the go and the life of the party. What we love most about her: Her sassy flair and her perpetually peppy mood! Daycare personality: Snow packs a lot of charisma and personality into a small body. He's an attentive guard dog, always the first to let passersby know that they're on his turf here at Unleashed. He can be tempted into a wrestling match or game of chase on occasion with the right crew, but mostly he prefers to observe the action from a shady corner, like a prince watching over his subjects. And if you're sitting still you can be sure that you'll feel Snow's head wiggling under your hand, encouraging you to start petting him. Favorite toy: Any toy with a price tag on it in the lobby of Unleashed. 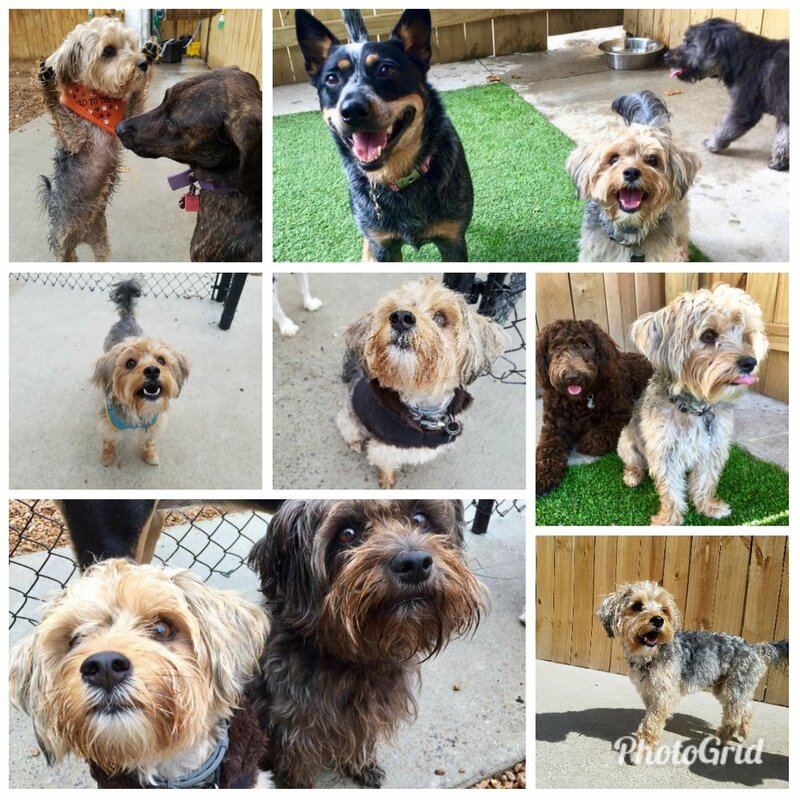 Daycare personality: Dexter brings an easygoing energy to Unleashed. He's always up for some roughhousing or running around with his friends, but he's not easily ruffled when other dogs get overzealous in their play. Instead, Dexter will defuse the situation with a step back, and maybe a long, slow play-bow to remind everyone to take it easy. Dexter's a total lover, as well; his greetings are boisterous yet always gentle. He's also the first one to check in on you if you sit down, which includes a big kiss and an attempt to climb in your lap. What we love most about him: His full body hugs, prim posture, and just generally everything about him! Favorite toy: Tennis balls are Sophie's all-time favorite, although she appreciates anything that can be thrown for fetch. She will even leave her ball in her water bowl while she drinks just to keep it in sight! Daycare personality: Sophie is a happy-go-lucky pup who enjoys human and canine company alike. She can often be found cooling off in the wading pool or roughhousing with any number of pals. Sophie also likes to check in for back scratches, snuggles, and belly rubs throughout the day. What we love most about her: Sophie is super energetic and playful, but always loving and cuddly. Favorite toy: A soccer ball, of course! 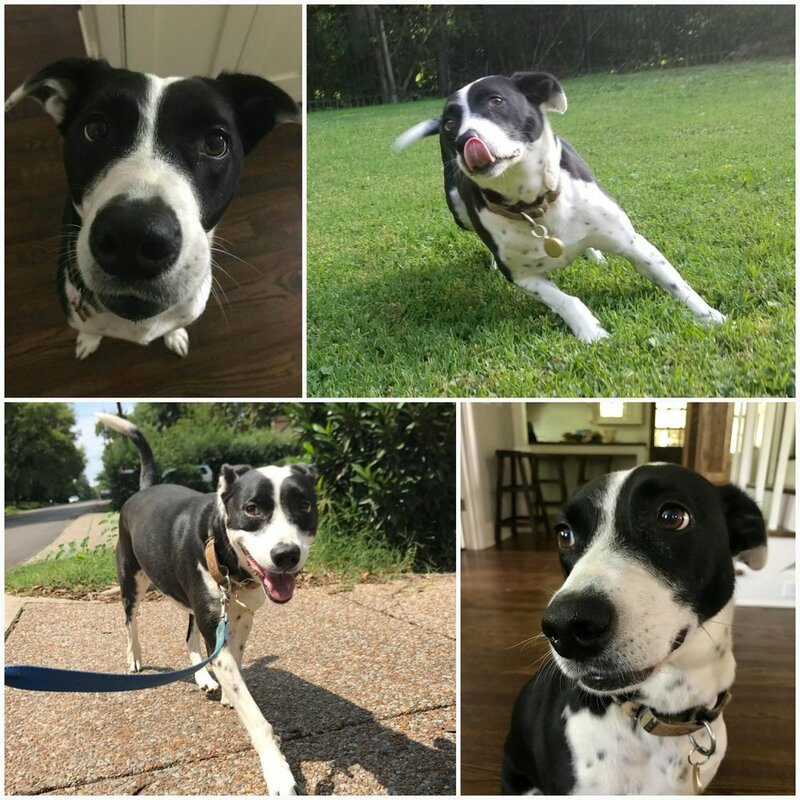 Walk personality: Penny is very strong-willed: if she wants to stop for a sniff, or crawl under a bush for some shade, you might be there for a little while. But she can always be enticed to continue if you throw a stick ahead for her! And she's always game to climb some stairs around her apartment complex. What we love about her: Her gregarious nature, big personality, and hilarious quirks make Penny a joy to be around. Her favorite things: Getting muddy, playing soccer with one tennis ball while carrying another in her mouth, relaxing on the highest perch she can reach on the couch. Play personality: Winnie is most content with some kind of toy in her mouth - once she's got something to carry around, she's happy to engage in whatever her friends are doing, whether it's a wrestling match or a game of chase. Winnie's short nose means she heats up and tires out quicker than other dogs, so she needs lots of breaks from the action. But when she's going, she's always going hard! What we love about her: Winnie's a total ham - her goofy personality, silly antics, and expressive face always keep us in stitches!